Advice columnist Aggie Mundeen and SAPD Detective Sam Vanderhoven plan their first rendezvous at a San Antonio River Walk hotel during Fiesta Week--sumptuous sights, sounds and festivities in the middle of America's Venice, a vacation from crime and a reset for their tumultuous relationship. But murder descends on Casa Prima Hotel. Disturbing revelations surface about the Fabulous Femmes, Aggie's new friends holding a convention. Evil emerges at parties in La Villita. Calamity plagues Aggie's debut dance performance at Arneson River Theater, the celebration skewed by carousing, crazies and corpses. Even in idyllic River City, crime complicates relationships. While Nancy G. West was writing her award-winning suspense novel, Nine Days to Evil, a funny thing happened. Supporting character Aggie Mundeen demanded that Nancy write about her. Aggie was on to something. 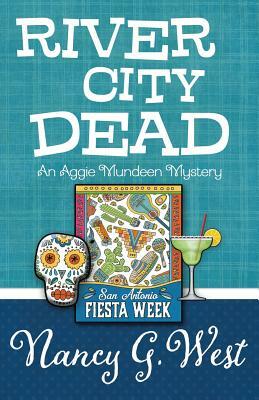 Aggie's first caper, Fit to Be Dead, was Lefty Award Finalist for Best Humorous Mystery. Dang Near Dead was a Chanticleer Award finalist, and Smart, But Dead was short-listed for the Mystery & Mayhem Award. Nancy lives in San Antonio, the setting for River City Dead.